The relationship among business processes, controls and evaluations of controls, from Frequently Asked Questions about EPAP. At the bottom of this diagram is the Business Process. A good example of a business process is the collection of gas charts and meter readings. 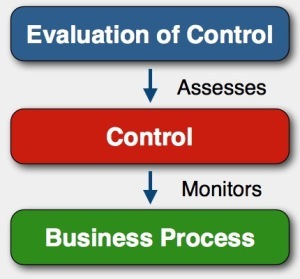 Above the Business Process is the Control. A good example of a control is the logging all the gas charts and meter readings to ensure all the expected data has been gathered for a given production period. Above Control comes the Evaluation of the Control. A good example of an evaluation of controls is to examine the log of gas charts and meter readings for a given production period. To invite a Corvelle consultant to your office to describe these relationships and how to keep them distinct, please contact us.